Dublin, OH - July 17th, 2017 – Embassy Suites by Hilton Columbus Dublin has been recognized with a 2017 TripAdvisor® Certificate of Excellence. Now in its seventh year, the achievement celebrates hospitality businesses that have consistently delivered a quality customer experience and earned great traveler reviews on TripAdvisor over the past year. The Certificate of Excellence takes into account the quality, quantity and recency of reviews submitted by travelers from around the globe on TripAdvisor. In addition to positive online guest reviews, hotels must maintain an overall TripAdvisor bubble rating of at least four out of five, have a minimum number of reviews and must have been listed on TripAdvisor for at least 12 months. "Our team strives to ensure each guest&apos;s experience is memorable and positive during their stay while exemplifying a true spirit of hospitality," said Becky Miller, general manager. "We are honored to be recognized by travelers as a place where service is a top priority." The newly, renovated Embassy Suites by Hilton Columbus Dublin provides guests with a full complement of services and amenities, including over 12,000 square feet of event space, Kilpatrick&apos;s Restaurant, indoor pool and fitness center. All Embassy Suites by Hilton hotels offer free made-to-order breakfast each morning, a nightly complimentary Evening Reception* and two-room suites with a separate living area, private bedroom, two flat-screen high-definition televisions and wet bar fitted with a microwave, complimentary 24-hour fitness and business centers, mini-fridge and a selection of gourmet coffee and teas from The Coffee Bean & Tea Leaf. Embassy Suites by Hilton by Hilton Columbus Dublin participates in the Hilton Honors® loyalty program, which is open to all guests and free to join - visit here for enrollment information. Hilton Honors members who book directly through preferred Hilton channels have access to instant benefits, including a flexible payment slider that allows members to choose nearly any combination of Points and money to book a stay, an exclusive member discount, free standard Wi-Fi, as well as digital amenities that are available exclusively through the industry-leading Hilton Honors app, where Honors members can check-in, choose their room, and access their room using a Digital Key. 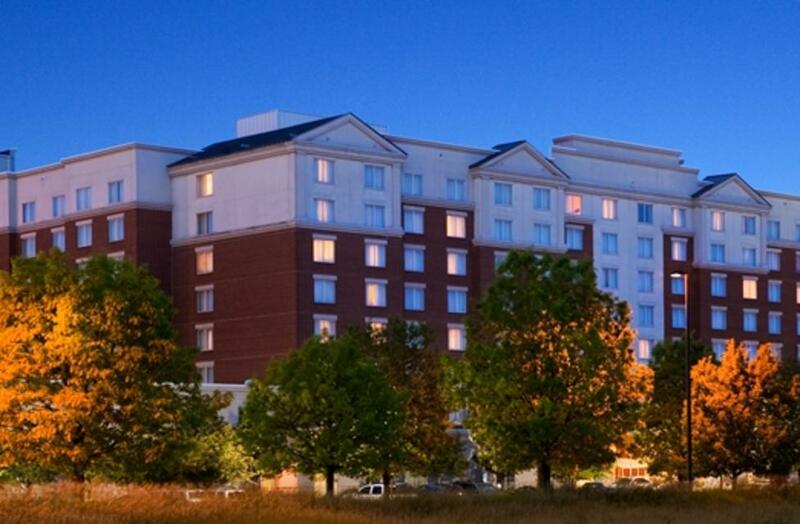 Embassy Suites by Hilton Columbus Dublin is located at 5100 Upper Metro Place Dublin, OH 43017. For reservations, visit embassysuites.com or call 614-790-9000. Embassy Suites by Hilton, one of Hilton’s 14 market-leading brands, is dedicated to delivering what matters most to travelers. The full service, upscale brand offers two-room suites, free made-to-order breakfast and a nightly two-hour reception with complimentary drinks and snacks. Both leisure and business travelers looking for a relaxed, yet sophisticated experience will feel right at home with brand-standard amenities like inviting atriums and complimentary 24-hour business and fitness centers. Embassy Suites by Hilton has more than 230 hotels with 49 in the pipeline. Hilton Honors members who book directly through preferred Hilton channels have access to instant benefits, including a flexible payment slider that allows members to choose nearly any combination of Points and money to book a stay, an exclusive member discount that can’t be found anywhere else, free standard Wi-Fi and digital amenities like digital check-in with room selection and Digital Key (select locations) available exclusively through the industry-leading Hilton Honors app. For more information, visit embassysuites.com or news.embassysuites.com. Connect online with Embassy Suites by Hilton at Facebook, Twitter and Instagram.